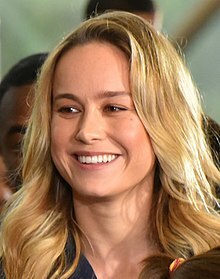 Brianne Sidonie Desaulniers (born October 1, 1989), known professionally as Brie Larson, is an American actress and filmmaker. Noted for her supporting work in comedies when a teenager, she has since expanded to leading roles in independent dramas and film franchises, receiving such accolades as an Academy Award and a Golden Globe. Time magazine named her one of the 100 most influential people in the world in 2019. Born in Sacramento, California, Larson was homeschooled. At age six, she became the youngest student admitted to a training program at the American Conservatory Theater. In the past I've been very into the falling part, very into the swimming in the dark, deep emotional water. 'Rampart' I really went into it and it took me three times as long to get out of that depression as it did to just do the scenes. I had to learn to give it my all and then go home and laugh. I was home-schooled, was always very close with my mom, and was very straight-laced and square. I was never the rebellious one, and I never threw hissy fits. I was the type of person that would show a Powerpoint presentation about why I should do something versus crying and screaming over it. The idea of singing and dancing throughout my life and finding that bliss is something I wanted to express and explore within myself and hopefully spread that idea to other people. I'm not a gourmet. I just like the planet. I love exploring the characters that I play, but the reason I sign on for something isn't the details of the story but the universal message. Sometimes you never fully understand why you are attracted to a project until you get deeper into it. When I was younger, watching movies, it felt like everything was glossy and beautiful, and I didn't really relate to it. You could put me on a stage in front of 100 people, and I could do a tap dance, but one-on-one was really difficult for me. And it took me most of my life to learn how to work with that anxiety, to embrace and be comfortable with it. I really love learning about animals. I pull from a deck of spirit animal cards. You pull one, and it's about 50 or 60 different animals, and then that day you read whichever animal you pull. And it kind of gives you insight. I think my mystery, or any person's mystery, is the thing that makes them most interesting. I try to be as conscious as possible of keeping that alive. To find the courage to do what I want to do for myself has been hard. I think that I write about stuff that others don't write about. I don't have a bunch of love songs cuz I don't really have much boy experience. I just write about what I am actually going through in my real life. What 'Short Term 12' did was it gave me the confidence to explore my intuition more. The healing process that came for me for making that movie and then sharing it with people - I was able to see, first hand, that movies can have a healing power and they can teach us things. I had collages in my bedroom when I was a teenager. Laughter is the best way to get over something or get closer to something. It's one of the things I respect most about Amy Schumer. She's found a way to get us closer to ourselves and see the ugly side of humanity, but not in a way that's pointing a finger or that's angry. She does it in a way that makes us see the absurdity and laugh at it. The cool thing about designers is they have very specific points of view, and because my inspiration is always changing, it's easy to go, 'This feels right.' But just because I wear fancy dresses on weekends doesn't mean in my heart of hearts I'm not a jeans and T-shirt person. I'd say there's more of a difference between a play and movie to TV than there is between TV and movies. But there's something involved in the repetition of things that require something different from me in order to sign onto a script. I watch clothes on other people, and it's like having a conversation before opening your mouth. For me, clothes come from the mind. They represent what's happening inside, and as long as they feel honestly like what I'm thinking about and going toward, I'm happy to bounce around and experience different things.